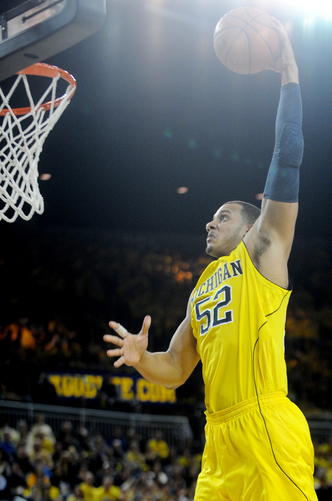 Posted on Sun, Feb 19, 2012 : 1:40 a.m.
Perhaps caught up in an emotional moment, Michigan basketball forward Jordan Morgan was unable to put his performance into words Saturday night. So, senior Zack Novak did what any good captain does. "He played like a man tonight," Novak said bluntly. "Everyone talks about (Ohio State forward) Jared Sullinger, and he's a very, very good player. "But I think Jordan Morgan was up for the challenge tonight." In a moment where his team needed him the most, Morgan turned in the best effort of his Michigan basketball career in the Wolverines 56-51 win over Ohio State. Michigan sophomore forward Morgan Jordan dunks through two of his 11 points during a 56-51 win over Ohio State on Saturday. Playing against one of the best big men in the country in Sullinger, the 6-foot-8, 240-pound Morgan willed his way to 11 points and 11 rebounds, his first career double-double. Additionally, he played 35 minutes of stout defense against Sullinger, holding him below his scoring average (14 points) and forcing him to finish 6-of-14 from the floor. "We're playing for a championship, all we wanted to do was win," said Morgan, his voice slightly cracking with emotion. "We're playing for them, playing for our seniors." When most analysts discuss Michigan's long-term potential this season, the first thing they point to is deficiency in the paint. The Wolverines are too small. They don't have enough skilled big men. They can't rebound. And, surely, they can't handle a player the caliber of Sullinger. On Saturday, almost all by himself, Morgan discounted every one of those statements -- for one night, anyway. "You can't listen to that," Morgan said. "You hear it, but you just go out every game and do your job and take care of business. "Do what you've got to do to help your team win." Morgan's certainly come a long way from the player who received mid-major level interest before redshirting his first season at Michigan in 2009-10. And he's still far from perfect. He's had constant bouts with foul trouble this season, continues to work on his foul shots and often struggles to be assertive around the rim. There was nothing soft about Saturday, though. Morgan out-rebounded one of the best big men in America, brought the house down with two thunderous fast-break dunks and found a way to stay on the floor for 35 minutes. In Columbus, Ohio, last month, the Wolverines were bullied inside, as Ohio State dominated the offensive glass and turned in 16 second-chance points. On Saturday in Ann Arbor, thanks in large part to Morgan, the Wolverines actually outscored Ohio State in the paint by a pair -- 26-24. "Going against one of, if not the best, big men in college basketball, he showed it tonight," Michigan sophomore Tim Hardaway Jr. said. "We're proud of him." Michigan senior Zack Novak squints as powder is applied to his face before he goes on camera with teammate senior Stu Douglass during a Saturday morning taping of ESPN's College Game Day at the Crisler Center. Michigan put in extra-long work day Saturday. The Wolverines were featured on ESPN's College Basketball GameDay beginning at 10 a.m., then had to find a way to kill time until the late 9 p.m. start. Michigan basketball coach John Beilein was up even earlier than that, handing out donuts to the students lined outside the Crisler Center at 7 a.m.
"I wake up early a lot anyhow," Beilein joked. "I got to see a lot of our students this morning with smiling faces, and (wife) Kathleen and I were out there early with the donuts and it was great to see that. "I kept coming back and the line was still out there, and to walk into that arena today was a bit moving." It was likely one of the longest days the team has gone through this season. But in the end, it was well worth it. "Last weekend, when Vanderbilt was on GameDay, someone said their coach said he thought the team was caught up too much in the hype and not focused in," Michigan senior guard Stu Douglass said. "I didn't sense that at all with us. Not through walkthrough, not throughout GameDay, we had fun with it, but we were focused in completely. "And for the entire 40 minutes, we were focused. That might've been one of our most complete games." The Wolverines drew a total of five charges Saturday, helping push Ohio State's turnover number up to 13. Beilein has talked about multiple players on his roster showing an ability to stand in and draw a charge plenty this season, but Saturday seemed to be the most glaring example of that. "This is a team that we have five guys that will take charges," he said. "I've coached a long time and I've loved every player I've coached, but even some I loved don't take charges like this team. "As a result, that's been a big difference maker, and we're close to getting a couple more as well. It is unique." The three 3-pointers Michigan hit Saturday was a season-low. Additionally, the Wolverines only attempted 13 long-range shots, also a season-low. It didn't matter, though, as Michigan shot 55.8 percent from two-point range and got to the foul line 14 times, converting on nine attempts. "We don't want to be known as just a jump-shooting team," Beilein said. "We're trying to get the ball inside. Whether it's by drive, whether it's by back door (cuts) or whether it's by residual action." 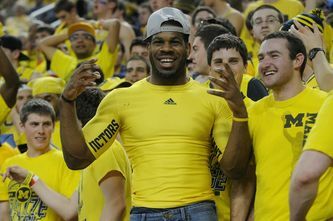 Former tight end Kevin Koger was part of a heavy Michigan football contingent at the Crisler Center on Saturday. Michigan football coach Brady Hoke was honored on the floor in front of the sellout crowd Saturday, eventually leading the fired-up arena in a rendition of "The Victors." Hoke then took a seat in the stands with several Michigan recruits and assistant coaches, including Greg Mattison, Al Borges and Fred Jackson. In the student section, the football team was well represented once again by Denard Robinson and Roy Roundtree, as well as Kenny Demens, J.B. Fitzgerald, Blake Countess and Kevin Koger. The game featured no ties or lead changes, with Michigan holding a lead for the full 40 minutes. Michigan led by as many as 10 points, and the Buckeyes once drew within one point, but no closer. Michigan freshman point guard Trey Burke has now led the team in assists in 23 of the team's 27 games this season. ... Saturday marked the third time Michigan has beaten a top 10 opponent this season. The other two were then-No. 8 Memphis and then-No. 9 Michigan State. Sun, Feb 19, 2012 : 3:02 p.m.